No. 3, Jalan YTN 3, Industri Desa Aman, 52200 Kuala Lumpur, Malaysia. 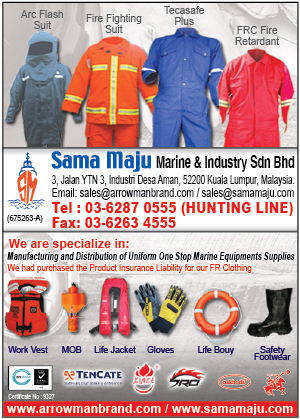 Sama Maju Marine & Industry Sdn. Bhd. (SMMI) was established in year 2002 specialize in manufacturing and distribution of uniform, supplies of marine safety Equipment, Marine Hardware, chemical products, electrical products and servicing of Liferaft and Fire Fighting equipment. Our factory is located in China, whereby it provides a competitive pricing and produce high quality uniform to our business partner in Malaysia and Oversea. SMMI manufacture all types of uniform as per customer requirements. Most of our customers are consist of Marine and Oil & Gas Industry. SMMI continues to recognize the importance of products establishments and service requirements. All our products that SMMI supply meet the requirement of International Maritime Organization (IMO) by complying with Safety of Life at Sea (SOLAS) standard. SMMI has become a large-scale trading corporation in Malaysia and manufacturer of Uniform at China by its 3 years of developments. It is on the Top List in comparison with Malaysia's 120 Large Capital goods trading corporations and companies. Our corporation has established a very strong connection with Manufacturer of marine products at China and Europe.SMMI has a very powerful contingent of Technical and trading personnel. SMMI will provide you best and efficient services in order for you to achieved full satisfactory.